I have had these papers published during my PhD as a sole author or contributor. Links to full text articles are included where available. Baxter, K. (2017) Topography and flight: The creative application of aerial photography and digital visualisation for landscape heritage, PhD Thesis: University of Dundee. Baxter, K. (2014) Grounding the Aerial: The Observer's View in Digital Visualisation for Built Heritage, Electronic Visualisation and the Arts: proceedings of the EVA 2014 conference, eds. K. Ng, J. Bowen and S. McDald, London, pp. 163-170. 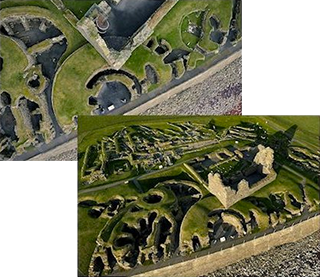 Baxter, K. (2014) Jarlshof Lost and Found: Low altitude aerial photography and computer-generated visualisation for the interpretation of the complex settlement remains found at Jarlshof, Shetland, Internet Archaeology, (36). Contribution - Waterson, A., Baxter, K., Watson, A. (2014) Digital Dwelling at Skara Brae. Art and Archaeology: Collaborations, Conversations, Criticisms, eds. I. Russel and A. Cochrane, London: Springer, pp. 179-195. My aerial photographs have appeared as contributions and features in the following periodicals and book publications. 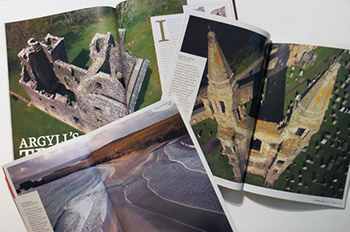 Text and photographic article in The Magazine of the Architectural Heritage Society of Scotland (2018) - "Scotland's historic environment as seen from the skies", No. 41: Spring 2018. pp. 24-27. Full spread photographic feature in Current Archaeology magazine (2018) - "Context" feature, Issue 335: February 2018. pp. 18-19. Full spread photographic feature in Current Archaeology magazine (2017) - "Context" feature, Issue 330: September 2017. pp. 18-19. Photographic contribution to Historic Scotland Members Magazine (2017) - "The Long View" article, Summer 2017 issue. pp. 22-26. Front cover and photographic contributions to guide book - Pickering, R. and Foster, S. (2017) - Maeshowe and the heart of Neolithic Orkney, Historic Environment Scotland. Front page image and photographic feature in local newspaper (2016) - The Courier weekend magazine, February 13, 2016. pp.4-6. Photographic contributions to archaeological report - Ewart, G. and Gallagher, D. (2015) - With Thy Towers High: The Archaeology of Stirling Castle and Palace. Historic Scotland. Book contribution - Weir, A. (2015) The Lost Tudor Princess. London: Jonathan Cape. Book contribution - Parker, P. (2014) The Northmen's Fury: A History of the Viking World. London: Jonathan Cape. Contribution to document produced by Historic Scotland for UNESCO (2014) - The Heart of Neolithic Orkney World Heritage Site Management Plan 2014-19. p.2. Photography competition winner (2013) - Antiquity: A Quarterly Review of World Archaeology, Ed. Chris Scarre, 87 (336) p.325. Photographic contribution and overall competition winner (2013) - Broughty Ferry Traders' Association Calendar 2014. Full page article and photographic contribution in local newspaper (2013) - The Courier Central Edition, August 16, 2013. p.3. Four-part, full spread feature in Aurora: Magazine for Highlands and Islands Airports (2012) - The Big Picture, Spring to Winter issues. Photographic contribution to Historic Scotland Members Magazine (2012) - "Argyll's Treat" article, Autumn 2012 issue. pp. 36-37, 40. Book contribution - Burgess, C. (2008) Ancient Lewis and Harris: Exploring the Archaeology of the Outer Hebrides. Stornoway: Comhairle nan Eilean Siar, pp. 57, 72.